Six bodies have been recovered from the sea after a helicopter crashed off Morecambe Bay in Lancashire. A rescue operation was launched after the Eurocopter AS365N carrying seven people came down 24 miles offshore. The aircraft took off from Blackpool Airport and was ferrying Centrica staff from gas platforms in the bay. Two crew members and five rig workers were aboard. RAF rescue helicopters, coastguard and RNLI crews, and a rig support vessel joined the search. The bodies of six men have been recovered and were brought ashore, Lancashire Constabulary said. The search was continuing for the other missing person, a spokesman added. Emergency phone numbers for relatives to contact - 01772 410772/410774. Detective Superintendent Mick Gradwell told BBC News 24: "There was a very quick rescue response because people were on the drilling platform waiting to be picked up and they actually saw the helicopter ditch in the sea." The witnesses were being brought to Blackpool airport so the police, the Civil Aviation Authority and other agencies could "piece together" what had happened, he added. 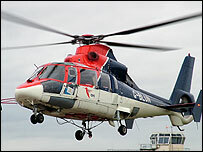 The helicopter, operated by industry transport firm CHC, left Blackpool at about 1800 GMT. Det Supt Gradwell said conditions were cold but it was not very foggy when it crashed some 40 minutes later. It had picked up passengers at two platforms and was heading for a third. He said police were unaware of any emergency calls having being received. The MP for Morecambe and Lunesdale, Geraldine Smith, said: "It's been a horrific accident and our thoughts and prayers are obviously with the family and friends of those who have lost their lives. "I just can't begin to imagine what they would be going though at this time, but we've still got approximately 60 people working out on the Morecambe Bay gas fields and they will be feeling pretty traumatised," she added. Centrica said it is contacting all families connected with its Morecambe Bay gas fields. Relatives of Centrica employees can call a dedicated helpline on 01524 864585. The rescue is being co-ordinated by Liverpool coastguards and lifeboats from Fleetwood and Barrow have been sent to the scene. 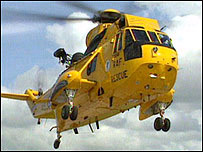 Rescue helicopters from RAF Valley and RAF Leconfield were called out. Gas was discovered in the area in 1974 and extraction operations began 11 years later. There are about 143 Centrica staff working on the platforms at any one time. I was in The Steamer Public House Where the crew of Fleetwood Lifeboat were having their Christmas party. Then around 7.30pm pagers and phones started going and the next minute they were out the door and heading for the boat house. I live in Lytham St Annes next to Blackpool Airport, where the helicopters that service the rigs in the Irish Sea are operated by CHC Scotia. I see and hear them everyday and always hoped that there would never be an accident. The people on the rigs do a fantastic job in difficult conditions, and the pilots are highly skilled, flying often in quite difficult weather conditions. My thoughts are with the people on board and their families. My friend was in that crash, my deepest sympathy to all family and friends affected by this. I was sure I saw the helicopter fly over Heysham docks around 1815 quite low altitude. I drove down to the docks expecting it to land on the airstrip but it flew out towards the bay. Just like to say, I am in the offshore oil industry and also at work on an oil platform just now. This is tragically going to affect our families all over the industry. We are a tight-knit bunch offshore and all seem to know one another. This affects us all. Our thoughts are with the families.